Export objednávek do souboru strukturovaného XML. Možnost zakliknout data, která chcete exportovat, možnost exportu cen včetně nebo bez kódu, datum objednávky (od-do), eshop (multistore), stav objednávky atd..
Soubor s exportem se ukládá do "download/orders.xml"
Můžete nastavit CRONa pro automatické generování XML, včetně možnosti zvolit si, co má být zobrazeno..
We want to only export orders as they come in - either into individual files or append to an existing file. An external application will read these files and then delete them so OC can create a new file of only new orders. works great! thats what i need! hello, is it possible to make the xml file according to my format, and to get data from custom fields in the order? Also to have a link to produce the xml file and download? You can create cronjob to get xml file. About custom format and custom fields don't what structure you need. Great support. It fixed my issue, even if it was related to another module. I just purchased it. Is it possible to add product mpn to xml export fields? is it possible to export only new orders from the last run with cron? 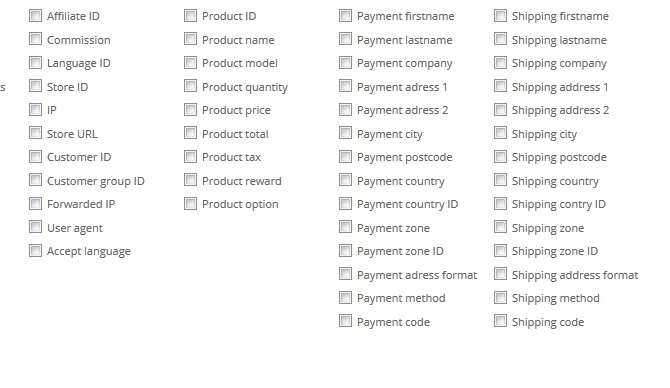 I dont want to export all orders again and again. Yes, you simply set date from -> date to in export script for cron and then simply set the same for cron job. Sorry, but I don't know what you mean by elements and attributes .. Code is open - so you can change xml structure as you wish. Excellent extension and best support, thank you Deawid. 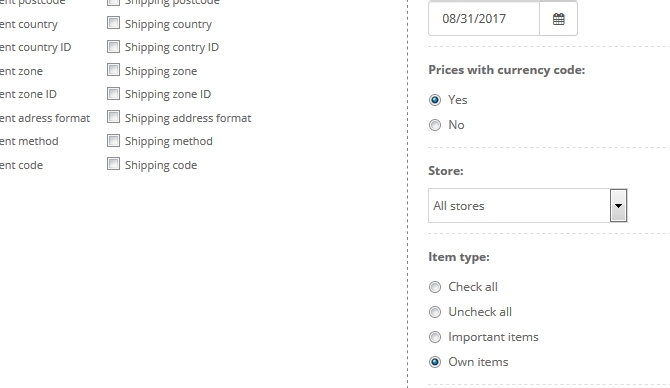 Please.. if you have problem with payment on opencart.. do not spam in comments .. simply create ticket on opencart support and wait until they help you. I can't help you with this problem. is it possible to set in the cron job url from which order id and after I want to export? Hi, for 3.0.2.0 it's ocmod. 'order_status' => '-', //order status ID ... for all orders set "-"
Díky za upozornění ... demo odkazy jsem updatoval.. zkuste nyní. 2) can I set the ordering of the fields in the export file? 3) can I set chron job that only exports orders not previously exported, or, only orders from say "today" or "this hour" or something like to to exclude orders previously exported? I am trying to get csv file for import into Peachtree accounting. Fields must be in order required by peachtree. 2. in excel export you can move code lines to sort exports. What is CRON for automatic generate XML and set what you want display. When open that url, XML is updated. updated for latest version 2.3.0.2. I would like to consult with you about your plugin before we buy it. We are a company that needs to automate the process of sending the new products from other companies to our system so we could update the data. I search many plugins on multiple platforms. Please respond as soon as possible, I didn't find any email for support so I can contact you. Have a nice day. I really appreciate the service to help get my XML Order export functioning properly. Is there a way to automate this to every order instead of once a day. Will it be able to pull all my product options? Will this export fire every time an order comes through or is it a batch mechanism? Thanks for a great extension. Quick question: How do you get the file to download locally? Thanks. Bump for 2.x, need this ASAP! do you think to update the extension for OC 2.x? Possibly for when? Opencart order information to XML extension works as advertised but the best part is the support. DEAwid offers great support for his extensions and he's also available for any Opencart issues you may have. Wonderful experience working with this developer. 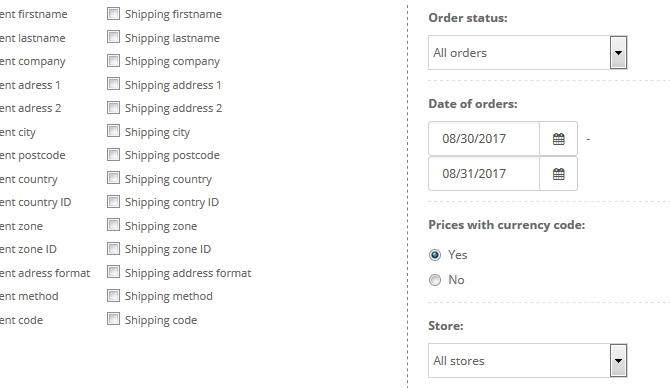 Hello, You have in options "Date of orders" may be You can add something like "Order ID between" to choose what orders may be exported? 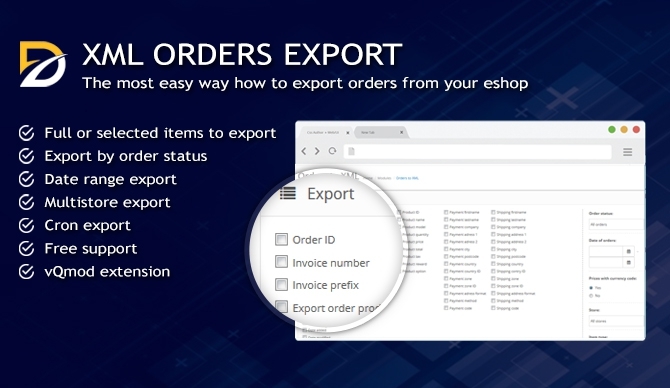 I like this module, set it with Cron for automated orders export and download once in a day (exporting orders for last 24hrs). And thanks for quick support! Hi, sure you can, but you must set CRON on your webadmin, no admin of opencart ..
We are using this to integrate our website with Sage, this mod does the job perfectly! 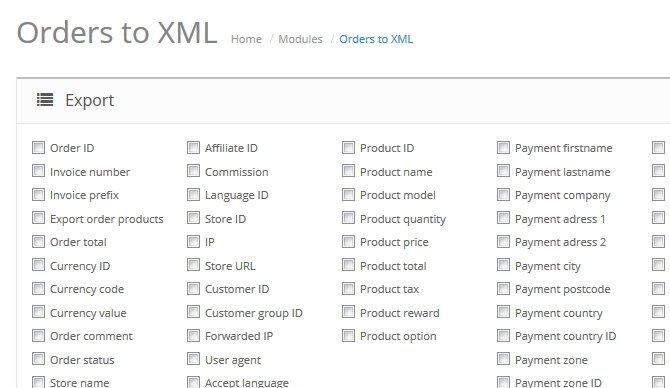 i have a question of this module is there a possibilty to send the xml sheet to a wharehouse or a fulfillment house so they can manage the proces. Hi, few minutes ago I publish new version of my module. I add SKU and ISBN to export + update for latest OpenCart versions.